Dentures are prosthetics used to replace missing teeth, and range from a small partial denture which replaces a few teeth, to sets of full dentures which replace all of a patient's natural teeth. A full denture is required when all the teeth are missing from an arch, or when all of a person’s teeth require extraction due to disease. An arch refers to the complete set of teeth on either the lower (Mandibular arch) or upper (Maxillary arch) jaw. Dentures are more common in older patients because as we age our teeth naturally wear down and degrade. Combined with this is the fact that older patients also attended the dentist over the past decades, at a time when removal of all teeth and replacement with full dentures was considered far more acceptable. That being said, full dentures are still used today in a case where significant numbers of teeth are missing or damaged, and where it may become advantageous to replace all of the teeth with a prosthetic full denture. Fortunately we live in a time where teeth are being able to be retained much longer in our lives, and therefore full dentures are becoming less prevalent. In cases where full dentures are required, sometimes the insertion of dental implants can help in keeping the full dentures stable, rather than simply relying simply on suction, as has been the case in the past. A partial denture can also be used when a patient is missing several teeth in a single arch. They are typically made of either a combination of acrylic and chrome cobalt, or acrylic only. Removable partial dentures are typically held in place using clasps that wrap around the remaining teeth in the arch. They need to be removed each night, and sometimes after eating, to be cleaned and remove food debris that can accumulate underneath. Dentures have many advantages over not having any teeth that go beyond the obvious ability to chew, food. Dentures also improve pronunciation in speech as missing teeth, particularly the front teeth affect your mouth’s ability to form certain sounds properly. Dentures also drastically improve the look of your face, by providing the correct support for the soft tissues of the lips and cheeks and removing the ‘sunken’ appearance common in patients who are missing their teeth. Dentures greatly improve quality of life in patients by giving you the ability to eat the foods they enjoy, regain the ability to speak clearly and increase their self esteem through improving the appearance of their face. Dentures are a more cost-effective way of replacing missing teeth. Compared to fixed prosthesis crown and bridge work and dental implants, removable dentures can replace missing teeth at a much lower cost. They are however, removable, and generally less comfortable that the fixed alternatives. It is still important to be aware of potential problems that can arise, particularity when fitting dentures for the first time. When first wearing a denture, the brain may interpret the object in the mouth as food and react by triggering a salivary response. This usually only lasts for the first 48hrs until the brain becomes used to the denture and the salivary glands return to their normal output. If dentures are not properly fitted, or a person has unfavourable oral anatomy (eg. lumps and bumps of the gum or very little bone to sit the dentures on), they can become uncomfortable, causing sores at the contact points with the gums. If this is the case adjustments will be made by the dentist until the denture fits comfortably and securely. This is almost always the case with a new set of dentures, and multiple adjustment appointments will be required. Some patients can experience a gagging reflex from their denture. It is important to note that in order for a denture to fit properly, it must extend to particular points within the mouth, otherwise it will be unstable and not stay in when talking and eating. If the gagging problem cannot be overcome by adjusting the denture and persistence in wearing it, it may be a psychological rejection of the denture. In these cases a special palateless denture which is supported by implants can be constructed, although this inevitably leads to a more complex treatment and therefore incurs greater costs. 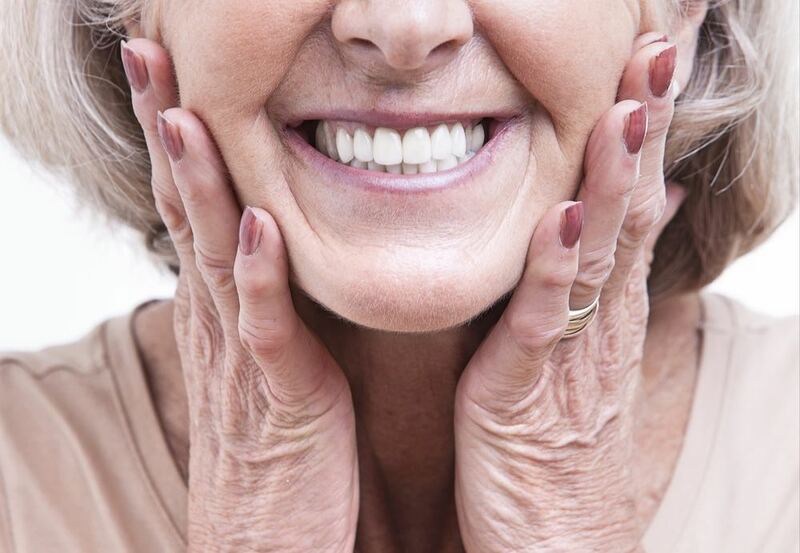 It is important to remember that dentures need as much care as actual teeth. The mouth is the perfect environment for bacteria. It is warm, moist, has lots of little places for bacteria to hide, and is constantly fed nutrients multiple times each day. Dentures are susceptible to the same buildup of plaque as real teeth and must be cleaned with an abrasive action to remove the plaque layer. This can be achieved by using a readily available denture cleaner, as well as brushing with a soft bristled toothbrush without toothpaste. Toothpaste is abrasive, and cleaning will result in micro scratches being placed on the denture, leading to further areas for bacteria to colonise and grow. In addition to brushing, dentures should also be cleaned in an immersion cleaner. The immersion cleaner will help reduce plaque and microbial invasion in the areas too difficult to brush. There are several different types of immersion cleaners available for dentures which have different strengths and weaknesses (eg. Polydent, Sterident, etc). If you are having major problems with your existing teeth, or are missing teeth and finding the daily use of your teeth difficult, then a denture may be a solution for you. Talk to the dentists at Care Dental Centre about the options available to you to replace your missing teeth.